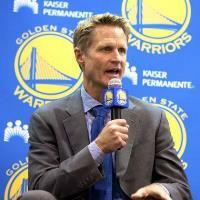 At just 51 years of age and in his third season as the Golden State Warriors head coach, Steve Kerr continues to make history as he already won 200 games since taking over the team. General manager Bob Myers took him to Golden State when he was about to sign with the New York Knicks and has since won a ring, achieved the best Regular Season ever (73-9) and reached another Final, in which his team wasted a commanding 3-1 lead against the Cleveland Cavaliers who won their first NBA title in franchise history. With a win in Houston and a run of eight in a row, Steve Kerr reached 200 regular season victories faster than any other coach in the history of the four major American leagues (NBA, NFL, MLB and NHL). His total balance is 200-38, an incredible 84% of wins with a 109-8 record at home and a 91-30 mark away from the Oracle Arena. The next-fastest coach in NBA history to reach 200 wins is Phil Jackson, who needed 270 games — 32 more than Kerr to accomplish the feat. The Warriors also have put together three straight seasons with 60-plus wins after they spent 68 years without reaching that many wins. Nobody since the 1996 to 1998 Chicago Bulls had accomplished that. After a 67-15 season two years ago that ended with the first NBA title since 1975, the Warriors improved last year to a NBA best 73-9 regular season record, that broke the Bulls’ previous mark of 72-10. Unlike the Michael Jordan-led Bulls though, Golden State failed to win the title. This year the Warriors own a 60-14 record after defeating the always combative and tough Houston Rockets led by MVP candidate James Harden. The Warriors still have eight games to play and the Warriors need to win just four to surpass the 203 total that the Bulls had from 1996 to 1998.